Wessex Archaeology undertook an extensive programme of trial trenching in advance of the submission of planning applications for the construction of a Defence Technical College and an Aerospace Business Pork. A total of 187 trenches were excavated, investigating five different areas of proposed development. These followed on from an extensive programme of geophysical survey. The evaluations revealed a palimpsest of remains ranging in date from the Bronze Age to the medieval and post-medieval periods. The earliest remains recovered comprised two Early to Middle Bronze Age cremation burials buried beneath a low cairn of stones. These were radiocarbon dated to 1640 cal. BC to 1450 cal. BC. A second possible cairn nearby was not investigated further. A group of Middle Bronze Age ring-ditches lie some 500 m to the north, overlooking the Llanmaes Brook, and may form part of a wider ritual landscape, along with the Late Bronze Age and Early Iron Age midden site found nearby at Llanmaes. Extensive Romano-British agricultural settlement was investigated, along with associated field systems. Pottery recovered from the site indicates that it was probably occupied from the 2nd to 4th centuries AD. A single prehistoric pit containing quantities of burnt stone and worked flint was also identified, hinting at earlier activity on the settlement site, at a period when the area was largely aceramic. A number of possible hearths or ovens were recorded, charred plant remains from which indicate some arable activity on the site, whilst the quantity of animal bones recovered also indicate some animal husbandry. In all the evidence suggests that the area was fairly intensively farmed in the mid to late Romano-British period. 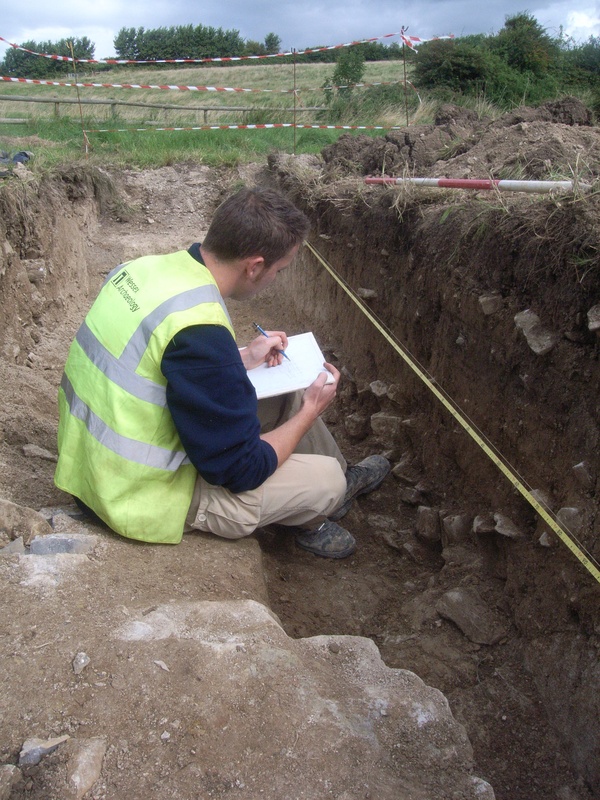 Concentrations of medieval activity were recorded in two areas, one apparently associated with a natural or man-made hollow adjacent to the line of a possible mill leat identified by the geophysics survey. The second comprised an area of medieval and post-medieval activity directly associated with the surviving medieval church at Eglwys Brewis, famed for its medieval wall paintings.